Co-developed by holistic veterinarian Dr. Burton Miller, D.V.M., Nature's Answer Pets products are scientifically-based, well-balanced formulations containing the highest quality of human-grade herbs, vitamins and supportive nutrients. Each product features an innovative blend uniquely created to deliver key nutritional support for today's most common pet conditions. Supplements feature a pump-delivery system for easy and accurate dosing on pet food, delivering to your customers the most bio-available form of nutritional support for companion animals available in the marketplace today. 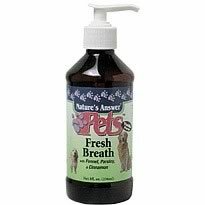 In addition, Nature's Answer Pets formulas are enhanced with irresistible flavors and come in shatterproof plastic bottles with high quality pump or spray dispensers. Place tip of pump into corner of mouth, divide dose between left and right cheek pouches; rub cheek over rear teeth to distribute product.